Jasper Newell in Samara. Photo by Julieta Cervantes. BOTTOM LINE: This exquisitely composed poetic myth tackles the duality of the ancient and the new, the concept of home, and the life cycle of a culture, but walks the line between enlightening and obscure. There’s something menacing about a space constructed completely of identical plastic pallets. The floor, the walls, the raised seating area for the audience are all covered in deep grey, which looks more like unyielding steel than malleable plastic: industrial, distant. And then you hear the first echoing tune from an Irish flute; it’s a sound that cuts through the ages, ancient, faraway. "Samara" is the name of a Neolithic culture of the 5th millennium B.C.E., situated on the Volga River long before Russia was a country. Its people are known for their egg-shaped pottery, shallow graves, and ritual horse burials (the earliest of the Old World). The Indo-Iranians came out of that culture, and eventually so did the Europeans, like a pair of twin blossoms sprouting out of the same fertile riverbank. Richard Maxwell’s play, a strange tale of redemption, is as mystifying as long dead legends from the Bronze Age. It starts slow, first at an outpost where a young messenger (Jasper Newell) seeks payment from a lone supervisor (Roy Faudree), but ends up buying a debt that the old man is owed, before killing him during a half-playful, half-premeditated struggle. The messenger thus embarks on an arduous eleven-day journey, which eventually brings him to "the other side," where the manan (Becca Blackwell) and the drunk (Paul Lazar, both delightful and profound) are cohabitants at a crummy inn. The messenger sets up camp at the inn, determined to stay until he's paid. The ensuing scenes are painted with broad strokes like those in a woodcut storybook, expansive yet intense, with a pace like that of the film Paris, Texas. The poetry of the story is completed by the forlorn sound of Ivan Goff’s Uilleann pipes and Anna Wray's percussion, which seem to conjure each piece of the puzzle that you might need to make sense of this perplexing play. The narrative goes on to be part "hero’s journey," where there seems to be a protagonist with a goal, except the perspective shifts from one to the next through a cycle of violence; as the pursuit continues, the purpose of the "hero" gradually diminishes. It is also part allegory, with characters speaking in riddles and conversing on big topics in ways that blur the line between enlightening and obscure. Steve Earle (who also created the mesmerizing score for the piece) reads stage directions and announces each scene change, bringing the writer’s voice to the stage. The directions are beautifully written; however, they confuse more than enhance the story, as Earle’s "stage manager" character isn’t really necessary to propel the plot forward, but at times actually interrupts it. Maxwell has written a series of gorgeous monologues that would delight anyone who appreciates the playwright’s poetic language and his ability to stitch infinity with one thread. Earle’s voice spins out the tales of an ancient hunter who shares the same features as the people of North America and upper Asia, a bird who glides through time without fear, and a deeply personal account of a parent and a child on a brief trip. In these stories, the juxtapositions of the ancient and the modern, the transient and the eternal, the invincible and the fragile, are clear. It is also clear that those tales aim to put all the puzzle pieces together. Unfortunately, the play lacks a strong through line or focus. The narrative doesn’t have much complexity, and the characters are not developed enough to be sympathetic: their motivations seem to come out of dramatic necessity rather than logic, and the resolutions are more rushed than satisfying. The cyclical nature of the characters’ life and relationships recalls Robert Schenkkan’s The Kentucky Cycle, which similarly delves into mythological concepts. But that epic nine-act drama covers an entire lineage and achieves clarity in a whopping six hours, as opposed to Samara's attempting to do so in 80 minutes. Beyond the narrative, the play carries way more concepts than one can process, before getting lost in a literal fog (which is featured in a final scene during which the audience sits in relative darkness and contemplates the stories they’re hearing). The play’s lack of focus is somewhat salvaged by Sarah Benson’s direction: she does a splendid job bringing out the beauty of the script, and making use of every inch of the space. The simple plastic pallets (Louisa Thompson’s genius set) are reconfigured into infinite possibilities, and the distance of a vast wilderness is made convincing in the confined theatre space with the director's clever staging. The production also has a cast ranging in age from fourteen to ninety-two, a rarity in the theatre. Veteran thespians Lazar and Vinie Burrows are impressive, their absolute ease giving more complexity to their otherwise vague characters. 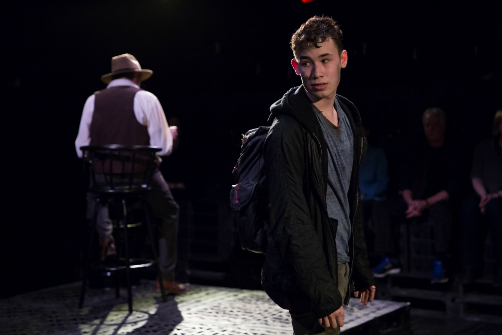 Newell, the youngest member of the team, also goes toe to toe with the rest of the ensemble, giving an outstanding performance as the messenger who's simultaneously vicious and vulnerable. There are many commendable things about Samara, from its ambitious concept and its literary values (the language is just so deliciously poetic) to its production style. It also promises a rich auditory experience, with Earle’s original music, written specifically for the play, performed live by skilled musicians Goff and Wray. The play deserves a lasting life, but like a tree with too many branches, it could benefit from some trimming. With a clearer central theme and a stronger narrative, Samara has the potential to soar. Samara is by Richard Maxwell. Directed by Sarah Benson. Original Music is by Steve Earle. Musicians are Ivan Goff and Anna Wray. Choreography is by Annie-B Parson. Set Design is by Louisa Thompson. Costume Design is by Junghyun Georgia Lee. Lighting Design is by Matt Frey. Sound Design is by Palmer Hefferan. Fight Choreography is by J. David Brimmer. Stage Manager is Rachel K. Gross. The cast is Becca Blackwell, Vinie Burrows, Roy Faudree, Modesto Flako Jimenez, Matthew Korahais, Paul Lazar, and Jasper Newell.